David Oliver Joyce passed his stiffest pro test to date with flying colors. 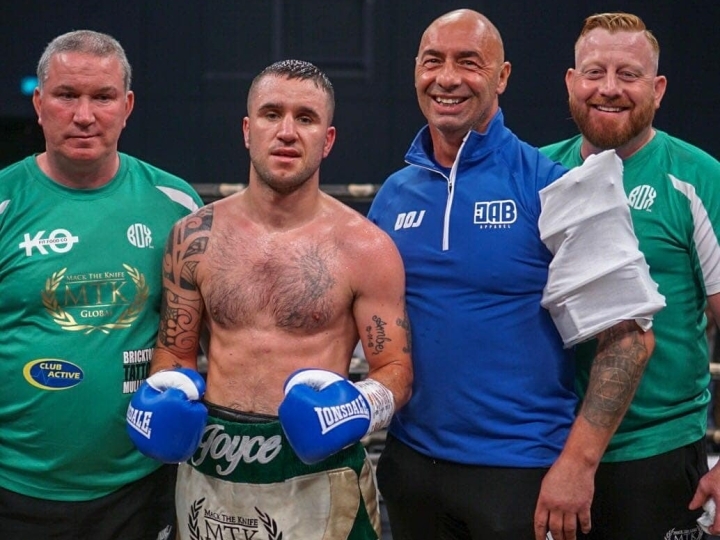 The 2016 Irish Olympian and aspiring featherweight prospect turned back a spirited challenge from Scotland's Stephen Tiffney en route to a 7th round stoppage Friday evening at Emirates Golf Club in Dubai, United Arab Emirates. Joyce scored a knockdown late in round seven, with an ensuing onslaught extending all the way to the bell, at which point the contest was stopped. Joyce had never before fought beyond six rounds, entering his first scheduled 10-round contest in the ESPN+ streamed co-feature. The 32-year old paced himself well against Tiffney, who'd previously never been dropped or stopped in his own young career. Well in control, Joyce (10-0, 8KOs) banked early rounds through controlled aggression. Tiffney was game but just overmatched enough to where he struggled to keep pace with Ireland’s rising prospect. That was at least until midway through the contest, when Joyce took his eye off the ball just a bit. Tiffney (10-2, 4KOs) enjoyed a brief rally, scoring with right hands and left hooks upstairs during an exchange which forced Joyce to employ earmuff defense. The Irish boxer was forcibly sent to the canvas, but the sequence was correctly waved off as as a push. The lone knockdown of the bout was clear cut, as Tiffney was slowly fading. Joyce regained his composure and went right back on the attack as he entered uncharted territory. Conditioning wasn't at all an issue as he entered round seven for the first time in his young career. An onslaught of power punches resulted in Tiffney being knocked down for the first time of his career. He barely beat the count and was seemingly out on his feet as Joyce battered him around the ring down the stretch of what appeared to be a very long round seven. Tiffney made it to the bell, but was clearly in no condition to continue. The referee recognized as such, waving off the contest before the Scot even had a chance to make it to his corner stool. The official time was 2:59 of round seven. Joyce fought in the 2016 Rio Olympics that saw disastrous results for Team Ireland, but with most of the squad—including reigning unbeaten and unified lightweight titlist Katie Taylor and featherweight prospect Michael Conlan—enjoying successful pro careers.